Originally christened as the Tennessee, the vessel was purchased by the Bay State Steamship Company in 1935 and renamed Romance. 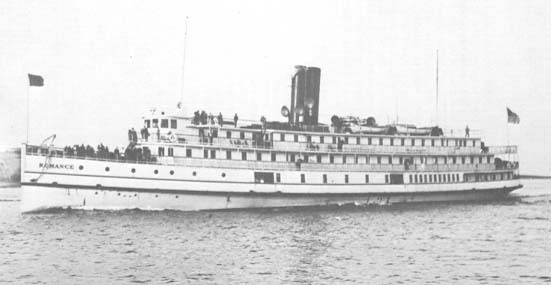 The Romance was an excursion steamer that ran the Boston to Provincetown route with notable speed and competitiveness. After only one year in service, the Romance collided in fog with the New York while en route to Boston. Inexperience on the part of the crew was one factor in the collision as well as the captain’s decision to turn away from the oncoming vessel instead of towards it. The two vessels collided and the fast moving New York nearly sheared the Romance in two. The 208 passengers onboard were evacuated to the New York, which did not back away from the ship but instead lowered ladders down to rescue the passengers and crew. While women and children were requested first, much of the Romance’s crew chose to save themselves first. No one was lost, however, and injuries were minimal, which is in part a testament to the Captain’s decision to keep the vessels locked together, thereby slowing the flooding. As the Romance sank, the deckhouse tore away. She was clam-shelled to remove any obstruction to navigation as she lies in a channel. Today, the wreck is located off Nahant in a debris field with a partially intact bow and boiler. The visibility tends to be poor, maybe 5-10 feet at best. However, in the winter the visibility can exceed 40-50 feet on a lucky day. The Romance produces many artifacts even today as she is infrequently visited. This wreck is an excellent dive for advanced recreational divers and novice technical divers who wish to learn techniques running guidelines in limited visibility.